Is It Time For Gay and Lesbian New Zealanders to Lose Their Victim Status? Apart from Rugby World Cup trophies, the one thing that New Zealanders fight for with the most intensity is victim status. Being a victim in our society is to wield the power of laying guilt trips on people, which often brings with it a free media platform to convince people to stop their behaviour and adopt others more to the guilt-tripper’s liking. Once you have achieved the status of victim no-one can disagree with you without feeling ashamed because if they disagree with you they automatically become part of the oppressor class, who all New Zealanders have been conditioned since kindergarten to reflexively despise. This social pressuring has an extremely powerful influence on the thoughts and feelings of the individual, but the problem with this cozy arrangement is this. The reason why gay and lesbian New Zealanders have, as of right now, an impregnable position at the very summit of Mount Victim is that being gay and lesbian is not highly correlated with significant measures of social deprivation in the country today. The average homosexual is actually fairly wealthy on account of being both better educated than average and being less likely to have children, a phenomenon known as the pink dollar. There’s no denying being gay and lesbian once was highly associated with measures of social deprivation and disenfranchisement. This is inevitable when you can literally get locked in a cage for being who you are. The contention of this column, however, is that this battle has long been won. Homosexuality became illegal in 1840 in New Zealand and legal again in 1986 – now thirty years ago – so the people that enforced the legal prohibition on it are all long ago dead and buried. 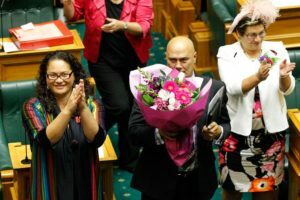 In the 2011 General Election, seven gay or lesbian MPs were elected to Parliament, which is almost six percent of the total – over twice the actual proportion of gay and lesbian New Zealanders (and this is ignoring the known homosexual MPs who are just not public about it). If your marginalised group is represented in Parliament at 250%+ of its proportion among general society, so much so that when a law is passed in your favour the entire Parliament will band together and sing a song of regret that they didn’t do it sooner, are you really that marginalised? The irony of the eternal battle for victimhood is this: once your victim status is recognised by your society at large, you are automatically no longer a victim, because you are instantly doing much better than all the oppressed people whose victim status is not recognised. The reverse of this is also an irony: in order to get into a position where you can do anything about being a victim, you have to get into a position where you are no longer a victim. This is why the physically and mentally infirm will always be at the bottom of society – simply because they are in the weakest position to advocate for themselves. It is exceptionally rare to meet a sick person wearing a suit and who is articulate as Grant Robertson. So perhaps it’s time for another marginalised group of New Zealanders to get some attention? If you are one of New Zealand’s 400,000 medicinal cannabis users, getting completely ignored by all parties is galling when you can turn the television on and hear Jacinda Ardern passionately arguing for legalising gay adoption – an issue which affects perhaps 50 people a year. Every day you are ignored is another slap in the face, another insult. But no-one will bring up your plight in Parliament, ever, and merely to point out that it’s time for you to displace some of the wealthy and powerful people raking it in at the victim table is seen as effrontery (no doubt many people will read the headline of this article and become outraged without reading the body). That’s a real victim of societal prejudice. Great read, and I wholeheartedly agree with this piece. Next Next post: If We Are in A Period of Excess Yin, How Would We Know?